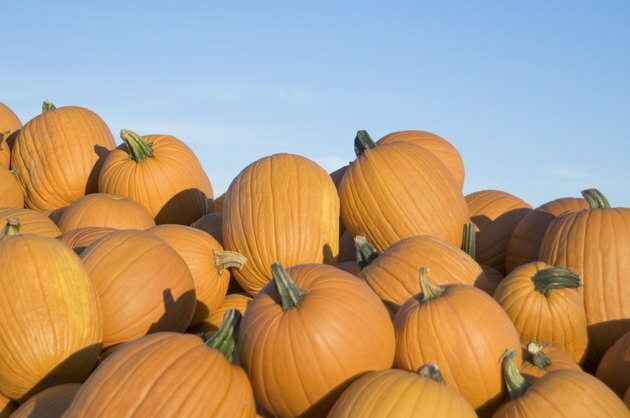 Delicious edible seeds can be harvested from pumpkins. Roasted pumpkin seeds have 125 calories per 1 ounce (oz) serving and are eaten as a snack or used in recipes as an ingredient. Pumpkin seeds have 11.9 grams (g) or 18 percent recommended daily allowance (RDA) total fat—2.3 g (11 percent RDA) is saturated fat, 5.4 g is polyunsaturated fat and 3.7 g is monounsaturated fat per 1 oz serving size. Pumpkin seeds contain 3.8 g (1 percent RDA) of carbohydrates of which 1.1 g is dietary fiber and 0.3 g is sugar per 1 oz serving size. Pumpkin seeds are high in protein, containing 9.3 g of protein per 1 oz serving size. Pumpkin seeds contain 108 international units (IU) vitamin A, 0.5 mg vitamin C, 0.493 milligrams (mg) niacin and 16 micrograms (mcg) folate per 1 oz serving size. Pumpkin seeds are rich in minerals containing 12 mg calcium, 4.23 iron, 0.854 mg magnesium, 332 mg phosphorus, 228 mg potassium, 5 mg sodium, 2.11 mg zinc, 0.392 mg copper and 151 mg manganese per 1 oz serving size.